India-Israel relations and India-United States (U.S.) relations have a come long way since the days of the cold war. As diplomatic relations between the Israel and India strengthened so has India-U.S. relations gained a lot of cohesion in the recent decade. Initially the United States began exerting its influence over policy, trade and sales between them especially those related to defense, and still does so officially. The United States exerts its control over Israeli weapons and technology sales and transfers to India for a variety of reasons. Although it is not the sole area of interest or region where the United States exerts its influence it is important given India‘s geographical location and rise to global power status. One reason that the United States objects to Israeli weapons and technology transfers even now is due to their collaborative nature and the presence of US technology and equipment which are subject to U.S. export controls and approval. The Arms Export Control Act (AECA) requires that no defense services be transferred from the U.S. government to a foreign government unless the recipient country agrees to the terms under the AECA. This means that it will not transfer the defense article to a third party or use it for any other purpose other than that which it was intended for without U.S. approval. These restrictions not only apply to defense articles or services but include dual-use technologies as well that are considered to possess the potential to endanger U.S. security interests under the Export Administrative Act. In conjunction with the restrictions under the Arms Export Control Act and Export Administrative Act the US State Departments Office of Defense Trade Controls (DTC) enacts further regulations. Through the Bureau of Political-Military Affairs the AECA utilizes the International Traffic in Arms Regulation, which contains a munitions list that provides a list of technologies, weapons and services deemed to be detrimental to U.S. security interests if exported. One example of U.S. influence over Israeli transfer of weapons and technology can be seen with the Lavi controversy. Due to its technologies coming from Washington and therefore subject to the AECA export restrictions on the Lavi project prevented sale of technology or joint development even though a significant portion of the technologies were owned by Israel. Israel‘s Defense budget that is around 14 -15 billion USD gives a spot in the top 15 ranked nation for military spending in the world, by IISS analysis. However this position and preparedness comes at a very steep price. Israel nearly spends about 17% of its total budget on defense. This shall have a 10% increase given last year‘s conflict in the budget allocation in 2015. Although usually not up for debates, Israel is finding it harder to press for higher budgetary allocation for defense over the last few years. Recent political and social movement and development in the European sphere of relations with Israel, it becomes imperative that Israel starts to develop relations with newer partners. In this India can play a crucial role given its steadfast defense relationship since normalization of relations in 1992. As Israel looks to diversify its sources of revenue generation, investing in India would garner a steady and long term provisioning for sharing this concern. In the past decade India Israel annual defense trade has been pegged around 1 to 1.5 billion USD estimated, with a potential to increase in the future given trends in cooperation and as a result of Free Trade Agreement, which may be signed in the near future. It is estimated to have an impact of increase in annual trade volume to three times the current mark to about 15 billion USD. That would amount to equal the current defense budget itself, if successful. India too faced a loss of development and induction time due to U.S. sanctions post Pokhran Nuclear tests in 1998. India‘s LCA program that heavily depended on the GE 404 / 414 Engines caused huge delay in the successful development and deployment of the LCA with the indigenous Kaveri Engine, which is said to have less power than what was envisaged for the LCA. However with the lifting of restrictive sanctions for these engines India shall procure initially the GE 404 and later 414 engines. The subsequent delay caused is one of many reasons that Indian decision makers show reluctance to accept newly proposed initiatives for critical hardware that even though proposed by the USA, has not been vigorously sought after due to restrictive transfer of technology clauses, and trust deficit. Such areas of cooperation need clarity and trust which has been dismally low in the past and given best of intentions, needs a lot to be done to convert them into mutually satisfactory deals and ventures. The recent decision in 2009 to halt supply of GE engines for India‘s Stealth Shivalik class Ships, due to its internal considerations, puts doubt in the minds of Indian decision makers about the reliability of the Americans in general, as has been the notion since the sanctions of 1998. Even though this decision to ban GE from facilitating its engines for operational status was not merely meant for India, even UK and Australia faced a similar ban. It only put strain on the already strong held notion of undependable reliance in times of critical needs. Even though US went into corrective mode later and offered state of the art fighter jets for the Indian Air force deal of MMRCA the Indians responded by removing the American offer on the basis of cost viability keeping the fences of doubts of reliability still intact. These fences of mistrust have to be overcome by mutual consent and joint collaborations within the framework of levels of security, and trilateral cooperation must be the higher end game. In this particular case India- Israel relations can play a decisive role as Israel is pivoted in a very trusted position by both India and traditionally by the USA, notwithstanding the recent incidents that suggest shift in US approach towards Israel. The start towards change in intent and subsequent action are expected to usher in optimistic trends with the Prime Ministerial visit of Mr. Modi to the U.S. last year. This visit was subsequently reciprocated by the President of the United States, Barak Obama as chief guest this Year, on India‘s Republic Day. This highlights the changing posture and dynamics which intends to go beyond pleasantries of India – U.S. relations. The recent negotiations and formation of the Joint venture between India‘s Kalyani group and Israel‘s Rafael for “..development and manufacture a wide range of missiles, remote weapon systems and advanced armour solutions is an era away from the way India & Israel interacted for defense relations among others, keeping everything under wraps. Success stories that need to build further along on the lines of Joint development need clearing mindset and bureaucratic hurdles in all three partnering nations. American concern with the implications of India‘s increased weapons capability on the South Asian military balance, is declining albeit gradually. Its fears that if India increases its military power it will seek to expand its sphere of influence through military ventures, is beginning to look like an asset to counter China‘s aggressive moves in the Indian Ocean region and the Pacific. Aside from the US interests to maintain the status quo of the regions military balance and balance of power, its veto of Israeli sales to India have not been solely for humanitarian or regional concerns. The United States has pressured Israel to ban the sale of certain weapons and technologies to other countries including India for fear that it would undermine their ability to enter the market to sell a similar item. Moreover it desires to create a friendlier climate with which it can increase high-tech trade and forge strategic ties with India. The intended objective it would seem would be to increase American influence or ties that it wants to create for Washington to have in the Indian American international relations. However, with the recent selection of Israeli Spike missiles in the face of American proposal to sell and co-develop Javelin anti-tank missile, and the subsequent signing of renewal of Defense Framework agreement of 2005 with impetus on defense trade, (joint exercises, co-operation in anti-piracy and maritime security operations and with an element of Defense technology trade initiative), still intact, with four of the 17 offered proposals, namely Raven Minis UAVs, roll on and roll off kits for C-130, mobile electric hybrid power source and Uniform Integrated Protection Ensemble Increment, within the renewed tenets of the agreement, suggests that India‘s market share and size can accommodate security systems, weapons and technology from the US and Israel without exclusivity to anyone. More so as the U.S. has the advantage in sharing technology and systems, that remains at present an “American only” option. As previously mentioned, Israel is a recipient of U.S. aid and technology and therefore a variety of restrictions are placed on sales or transfers of weapons and technology from Israel to a third party by U.S. exporting laws which restrict such transfers even if there have been alternations done, or the majority of technology is owned by the seller.The U.S policy of persuasion with regards to Israel has been seen on a number of other occasions where Israel sought defense contracts with other countries to fulfill its interests. This needs to be simplified where India‘s security interest are concerned, with regards to sale and purchase of Israeli weapons and weapons systems, to gather trust potential between the US and India. The US understanding and policy towards India, its position in the Asia Pacific, security, developments and other scenarios is based on the U.S. needs and interests in the region. The United States sees India as a rising global power with a similar government structure and the largest democracy in the world, therefore making India a natural partner. From the 2nd Bush administration to the Obama administration the United States policy towards India has gone from a very favorable policy towards India to ones that have favoured China over India. Under the Bush administration the view was that the U.S. ―must deal wisely with the world‘s largest democracy. Soon to be the most populous country in the world, India has the potential to keep the peace in the vast Indian Ocean area and its periphery. We need to work harder and more consistently to assist India in this endeavor. This policy was seen to gain significance in mid-2001 when ―India and the United States were building a new relationship that was based on military ties and an increasingly similar world view. The Obama administration policy was one that began with policies that had favoured China over India since it viewed China as essential to solving global issues, now a changing and challenging proposition to hold on to given recent Chinese escapades to break the status quo of US dominance in the Pacific theatre, security concerns with US allies like Japan and South Korea and hostile countries like North Korea. According to congressional reports from 2011, the basis of US-India partnership stems from its ―geography of a now strategically important South Asia region, and its vibrant economy, pluralist society, cultural influence and growing military power‖ which has made it a ―key focus of the U.S. The recent visit by the Secretary of Defense Ashton Carter and his discussions with Indian counterparts including the Defense Minister of India is seen as a favorable element in growing India US trust and cooperation. India‘s ―look east‖ policy, with its economic liberalization has allowed it to expand its commercial, diplomatic and security ties with East and South East Asia. These developments with its eastern neighbors are likely in response to China‘s growing regional influence and will act to further offset China‘s influence. To accomplish this the United States has offered weapons and weapon systems to India to further develop its military muscle and defense imports while ensuring the strategy does not undermine the willingness of all to cooperate on global issues. Although some Indian officials have been said to be wary of the implications of closer military and strategic ties with the U.S. and the effect it will have on their future related to freedom in designing their own foreign policy, in 2002, we saw some of these fears allayed when the first major arms trade from the U.S. to India occurred. This was subsequently repeated in numerous defense sales programs that have taken place since that includes USS Trenton, the amphibious landing Ship, 8 P8 Maritime reconnaissance Aircraft, 6 C130J Hercules aircraft, 10 C17 Globemaster Aircraft, and now recently approved purchase of 145 units of US M777 light howitzers, so far, through various deals and provisions specially under Foreign Military Sales. These deals have led to an increase in the much needed sense of security cooperati on and joint military exercises between the two countries. To achieve the transformation of relations the United States sought to lift the restrictions on the India for supply of nuclear fuel. In 2005 the Bush administration lobbied for and achieved the removal of these restrictions claiming it would ―strengthen nonproliferation in the region.This policy encouraged foreign investors to do business with India but its own American parliamentary policies still restricted the involvement of American companies. In conducting these deals the United States didn‘t require India to ―sign the comprehensive Nuclear Test Ban Treaty or put a moratorium on further production of fissile materials for weapons. This agreement will allow India to carry out trade of nuclear fuel and technologies with other countries and significantly enhance its power generation capacity. Even though the India US deal is still pending its full fruition due to individual concerns in the agreement entangled in the liability provisions of the act by both parties, it led to the general perception that it would be all-right to allow India to have Nuclear fuel, given its perceived and known status of reliable and responsible nation. This in turn allowed several other countries to conclude deals with India for her to get nuclear fuel. The recently concluded deal with Canada during Prime Minister Modi‘s recent visit to supply India with 3000 metric Tonnes Uranium fuel is one such arrangement among several nations that include Mongolia, Namibia, Kazakhstan, South Korea, Australia, France & Russia who have signed agreements to supply India with Nuclear fuel. When the US India agreement goes through, India is expected to generate an additional 25,000 MW of nuclear power by 2020, bringing total estimated nuclear power generation to 45,000 MW64. International relations and security considerations in the neighborhood between India and Pakistan have effects on American interests in regions such as in Afghanistan. While Indian peacekeeping capabilities and ties to Afghanistan have the potential to benefit U.S. efforts there, the tensions with India and Pakistan put the U.S in a position that potentially harms relations with both countries. The U.S. sees Pakistan as essential to its efforts in Afghanistan due to its proximity, providing it a strategic position and assets, while India has been the largest contributor to Afghan reconstruction projects. The tensions between the two countries are exacerbated by their desired role in Afghanistan with Pakistan claiming the U.S. should use its influence over India to remove its presence there. India on the other hand claims that it would not be there if the people did not welcome their presence which is supported by its historical policy of not intervening where it is not welcome. Although the Obama administration has refrained from taking a direct role in the dispute between India and Pakistan over Kashmir, its position is that it is linked to regional peace and stability. However, the greater the involvement of US and Israel in the region with India, politically (US-Israel-India), militarily (US-India-Israel, for shared technology and weapons and equipment), economically (US-India-Israel), through integrated projects and programs, the lesser the chance of mischief by state and non-state actors intending to harm peace and security in the region. India‘s desire to shift imports to co-production ventures with foreign suppliers ensuring it is not totally reliant on any one country, and hence has opened up its options for forming collaboration with Israel and US. In recent years ―Israel has roughly equaled Russia in its value of defense exports to India…topping 2 billion dollars annually. And USA has become the largest supplier since then, in 2014. There have also been new joint projects to develop missile technologies. Defense and high tech sectors should continue to succeed and be supplemented by Israeli defense technology and there is reason to believe relations will further strengthen in times to come, given now the First Prime Ministerial visit has been declared. U.S policy should work to satisfy interests and needs of self and India as well. Due to its growing role within the international community it has the potential to positively influence to world security and the regional security. Bringing it into the international community has benefits in the trilateral interest. 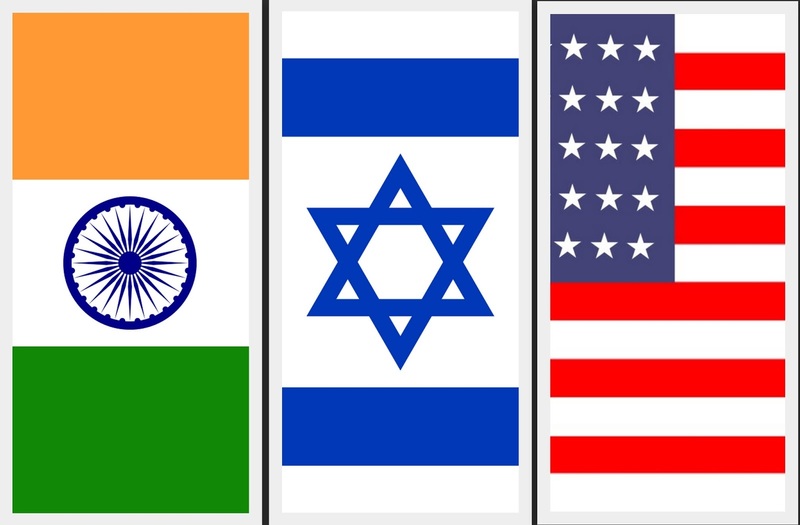 This article is an excerpt from a research article, titled "India-Israel-US Trilateral Cooperation Security Perspective: Challenges and Scope" published at FPRC New Delhi Journal.